Rumored to be the inspiration for Fox Mulder of The X-Files, Donald Keyhoe delivers the results of his groundbreaking research in a style that is at once terse and businesslike, and imbued with a sense of wonder at the mysteries and possibilities he is confronting. Keyhoe argues that aliens — whatever their origins or intentions — do not seem hostile, and have likely been surveilling the Earth for two hundred years or more, though Keyhoe writes that their "observation suddenly increased in 1947, following the series of A-bomb explosions in 1945." In the pulp tradition begun by Fawcett's Gold Medal series, Gutter Books is proud to offer you Gold Medal's seventh release, the stunning work of nonfiction that touched off everything we associate with the UFO phenomenon today—the widespread paranoia, the government disinformation campaigns, and the inevitable conclusion, for many people the world over, that UFOs exist and do not have an Earthly origin. Donald Keyhoe (June 20, 1897 - November 29, 1988) was an American Marine Corps naval aviator, writer of many aviation articles and stories in a variety of leading publications, and manager of the promotional tours of aviation pioneers, especially of Charles Lindbergh. In the 1950s he became well-known as a UFO researcher, arguing that the U.S. government should conduct appropriate research in UFO matters, and should release all its UFO files. 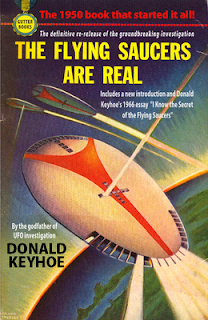 Keyhoe was widely regarded as the leader in the field of ufology in the 1950s and early-to-mid 1960s. Don't forget to leave your review on Amazon or Barnes & Noble! "[The Flying Saucers are Real is] based on official material and studiously avoids the wild speculations, naivete or prejudice of other publications." "An accurate account of the matter." Our edition is re-formatted for maximum reading pleasure and contains a new introduction and other bonus material! Available now. Usually arrives within 7 business days.